The Tuesday Trail to Grill Series is a 6-event series that takes place in some of the most beautiful parks in Seattle and the Eastside. Each event offers at least two distances, and all distances are a half marathon and less. Join us! 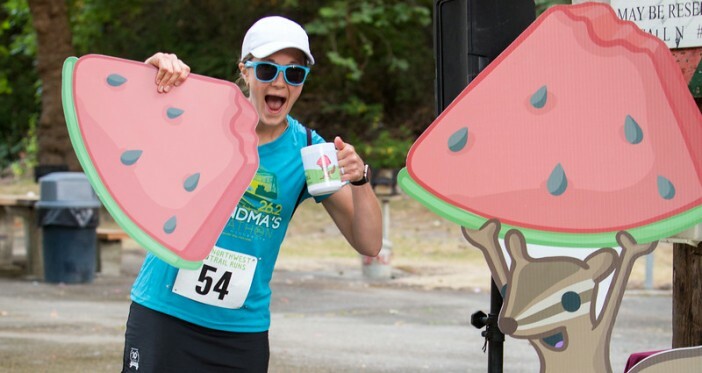 Next event in the series: Summer Eddy, 4-mile & 8-mile, August 11th, at St. Edward State Park. Your best 3 performances in the Tuesday Trail to Grill Series will rank you in the series standings! You may register for events individually, or use Series Registration to sign up for more than one event at once for your own convenience. Using Series Registration is not required to be part of the series competition. If you complete any of the 2015 season Tuesday Trail to Grill Series events, you are automatically entered. Points will be awarded based on finish placement, and this will be done separately for both women’s and men’s finishers. In the event of a tie, each runner’s highest point score is used for the tie-breaker. If two runners have identical highest point scores, then the next highest point scores are compared until the tie is broken. The top series participants receive special recognition at the final Tuesday Trail to Grill Series event, Interlaken Ice Cream Dash, on August 25th, 2015.